When I survey the most memorable of evil characters, it is female versions that first come to mind. Ron Rash’s title character Serena. Steinbeck’s Cathy in East of Eden. Lady Macbeth. 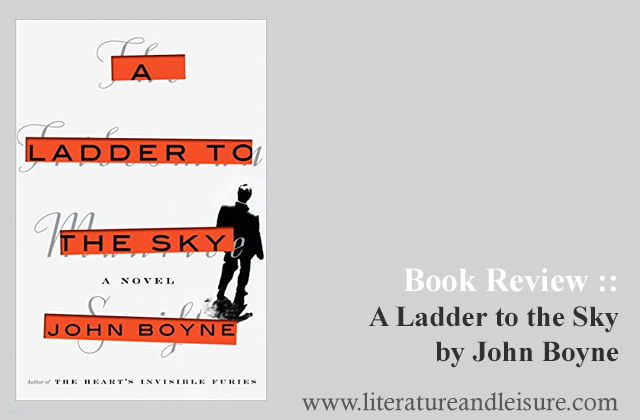 With A Ladder to the Sky, John Boyne has provided a new one – and he’s male. Maurice Swift is a want-to-be writer except for one thing – he has difficulty coming up with a good story. And so, he steals them. The narrative begins with Swift’s friendship with seasoned writer Erich Ackermann. Ackermann is infatuated with Swift and Swift uses the affection to lure Ackermann to tell Swift a story from his past – a story so intriguing that when Swift sells it as his first novel, it propels Swift to the forefront of young writers to watch. From here, Swift continues to steal his ideas – from friends, students, protégés, even his wife. Laid out in five episodes of Swift’s life, A Ladder to the Sky is three parts and two interludes. The main segments are written in first person from three different perspectives – Ackermann (a friend-admirer), Swift’s wife and finally Swift himself. Between each part is an interlude, written in third person. Each segment gives new insight into Swift’s theft of stories – both past and present. In every new phase, the lengths to which Swift will go to procure his next project increase in both duplicity and egregiousness. Also notable are the consequences to those who have been stolen from. For example, Ackermann is rendered a Nazi sympathizer. All the while the reader is loath to see Swift make his escape. Swifts’ motive is somewhat elusive, and perhaps this is what makes him such a villain. In his teenage years, it seems that he truly wants to be a writer and he just needs development. As a young adult, fame is more a driver, which also can be excused as immaturity. But as Swift ages, it seems that the sin itself is his motive – and the rush from having alluded discovery, especially once he knows just how much he has gotten away with. I loved A Ladder to the Sky. Emotionally, it made my heart race and my blood boil. Intellectually, the structure begs for contemplation. But simply put, if you love a book that is hard to put down and reminds you why you love to read, this is for you. P.S. I recently read another of Boyne’s novels, A History of Loneliness, and prior to reading this one I felt it could be a contender for one of my favorite reads of 2018. Now, I’ll have to consider this one as well. I was provided an advanced readers copy of A Ladder to the Sky by Penguin Random House’s First to Read program in exchange for an honest review. To learn more, go to firsttoread.com.